Adjustments might take a little of the sting out of the news that Sunday night’s Emmy telecast was a ratings catastrophe, but any adjustment will only make the nightmare a little less nightmarish. Instead of being the lowest-watched Emmys in its 69-year history, Sunday night’s telecast might be able to squeak into the second-lowest. As of now, though, it looks as though all that promised Trump-hating resulted in a record low, which is especially shocking (at least to bubbled Hollywood) because last year everyone was certain the bottom had been hit. Regardless, the die is cast. Last night was yet-another ratings flop for Hollywood’s Beautiful People. As of now it looks as though fewer than 11.3 million viewers tuned in to watch host Stephen Colbert’s hate-fest. That would mean the 69th Emmy telecast had fewer viewers than last year’s 68th, which currently holds the all-time low ratings record. What we do know for sure is that the 8.2 overnight rating is lower than 2016’s 8.4. Even in the coveted 18-49 age group, TVs Greatest Night flopped with a pathetic 2.8, which proves that even young people are tired of watching rich elites publicly work through their inability to come to terms with losing the 2016 presidential election. This news, of course, comes just days after the ratings for the MTV Awards hit their own record low. What has to be especially galling to Colbert and his fellow social justice glitter-warriors, is that in a country of 330 million, fewer than five percent tuned in, cared to watch even a minute of the show, was not in the least interested in their Big Thinks on issues n’ stuff, including President Trump who, despite the unrelenting hate campaigns from the media and Hollywood, still holds (if you believe the polls) a 40% approval rating. We all know it is higher, especially in the only states that matter. As Hollywood has gotten more political, more divisive, more bigoted towards Normal People, and more hateful, take a look at the nuclear fallout. America is more red, more Republican-led than at anytime since Reconstruction. On every level, Democrats have been wiped out of electoral office. Hollywood is a total liability to its own cause. 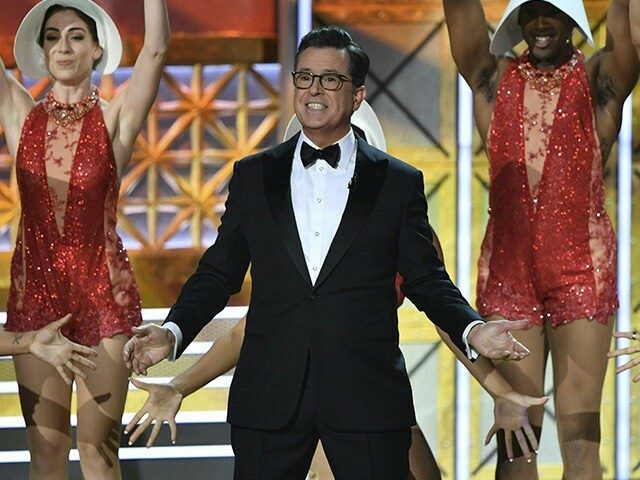 As awful as the Republican Party is — and it is awful — America looks at bigoted freaks like Colbert and cannot imagine putting such flaming hatred and intellectual incoherence in charge of the country. One Obama was enough. These raging, terrorist-supporting, spittle-flecked, mean-spirited multi-millionaires are the Democrat Party’s worst nightmare come to life, the most unappealing spokespeople imaginable. But look at the movie box office, the Oscar ratings, and last night’s Emmy ratings… Hollywood is not just bad for the Democrat Party, Hollywood is bad for Hollywood. All we are guilty of is hating Hollywood back.